For Everyone - Everyone can benefit from temporary storage now and then. See the many reasons why you should choose us as your local storage company when you do. Available Now - 143 New Storage Units - Contact Us to Rent a Storage Unit! Indoor Car Storage Keeps You Ready to Cruise - Don't let your valued vehicle collect dust just sitting outside. Self-Storage Keeps You Organized and Your Home Clutter-Free - Reclaim your living space! Manager living on-site ensures our facility-wide safe storage. Facility-wide security including galvanized steel walls and controlled unit access. Free rental available to make storage move in simple. A new section of our popular storage units are available now! Differences exist when choosing to store your valuables in Oregon storage units. Some storage facilities have weak security; some spaces make it hard to get to and from your unit, and some units look old and shabby. 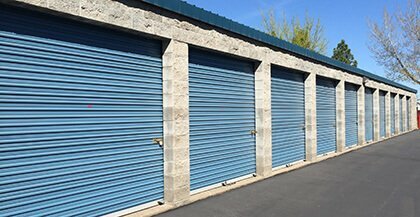 Many self-storage companies don't offer a good value for the price. Secure storage is different. We have designed our state-of the art Oregon self-storage around exactly what YOU want most: security, convenience, cleanliness, and a price that matches your budget. Secure Storage ensures facilities stay pristine all year long. That means no litter on the premises, self-storage units that are clean and paths that are snowplowed in the winter. Plus, our gate hours give you access seven days a week from 7 a.m. to 9 p.m.
Our state-of-the-art secure storage units ensure multiple layers of protection, from heavy-duty gates, digital surveillance and personalized electronic codes to storage unit alarms and on-site managers who live on the premises. Customers use our mini-storage units for a variety of reasons, whether it’s self-storage to de-clutter the home, business storage to expand capacity, climate-controlled storage to preserve special items, or RV storage and boat storage to support their active lifestyle. We’re a family-owned and operated mini storage that is deeply embedded in our local community. Our business aligns with our values, so we put the customer first and donate to local Prineville charities. This storage facility is awesome. The units are great. The staff is outstanding. I thought I set my account up as autopay, but didn't see it on my stayement. I called and Brendon helped me out. He got me set up on autopay w/email notification. This staff is amazing and treats you better than family. They always have a smile and always very helpful. Thank you secure storage staff! Great, I moved thinking it would be more convenient to store my RV in Bend, but I will move it back to Prineville when a space opens up.